This last Saturday in January brings the tour for Ratgirl: Song of the Viper to our blog. Like retellings? Then get ready for Ratgirl by Gayle C. Krause. For our stop we have our review and spotlight on this dystopian YA novel. Enjoy! I can always tell when I'm going to love a well written book. When I don't want anyone or anything to disturb and I lose track of time are all signs I'm lost and that's a good sign. When I began reading Ratgirl: Song of the Viper and realized I had to stop reading to drive my kids home, I knew Gayle C. Krause's storytelling chops had me fully engrossed in her world. The world of Ratgirl is a dark, depressing dystopian where the poor and middle class are reduced to existing like animals. The rich have the power for they have money which provides shelter and more importantly, food, which has become a commodity for all the others. The leader of this dank place, Metro City, is an antagonist readers hate immediately, the despicable Mayor Culpepper. As Jax, a teen girl trying to survive and take care of her younger brother in this stink and rat-infested hellhole, maneuvers her way through sewage-filled tunnels and filthy streets straight out of a Dickens' novel, we meet her rag tag group of friends and associates. This futuristic world suffers from a too powerful sun which makes the people seek protection underground, only to come out at night. Metro City is fully realized from the rich details, sights, smells and sounds of a dying place where people are fighting to exist. I thoroughly enjoyed the 'retelling' of the children's classic, The Pied Piper, with Jax as the rat leader able to make rodents follow her by using her singing voice. Paired with a depressing world and corrupt politicians, Ratgirl is a richly written, fully realized novel sure to delight readers from teens to adults. The secondary characters are developed enough to make it hard for readers to pick favorites. Of course, Jax finds romance while trying to find a solution to letting her brother have a decent shot at living the rest of his childhood in a better place and finding said place. When the Mayor kidnaps him, Jax has no choice but to go after him. Jax is a wonderful character, intelligent, quick, tough and yet kind with a good heart. She is not just a sibling but also a caregiver and substitute mom. An admirable young woman must thwart the evil Mayor with his sick plans to use the poor and children to build his new underground world. With a strange talent, Jax uses the rats to save those she loves while keeping the faith and hope to find a better place to live. What is not to love about this story? 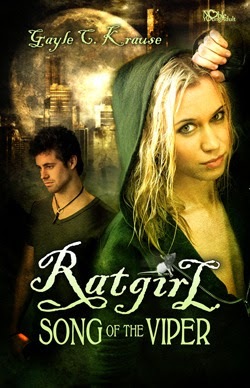 Tight, emotive writing, fast-paced and thorough, lots of action, bad guys we hate and heroines we cheer, Ratgirl kept me entertained and immersed in its futuristic society. Life in Metro City reminded me of the best parts of classic works like Oliver Twist, Fahrenheit 451, and The Hunger Games, and yet created an engrossing, gritty drama all its own. The Pied Piper is now a Viper and female, cats are rats, and the basic desire to survive and protect are common threads necessary in any hero/heroine. I have now added Gayle C. Krause to my list of authors to watch. I really like this cover. The dark colors and the light above the buildings are reminiscent of the story. I also like the models. I received a promotional copy in return for my honest review during a blog tour. I thank the author. During the course of her writing career Ms. Krause has served as assistant editor for Underneath the Juniper Tree, a dark fantasy online magazine developed for young teens, a children’s book reviewer for Children’s Literature .com and she offers a critique service for children’s writers at First Peek Critique. She also runs The Storyteller's Scroll, a blog that encourages new children’s writers through contests, book reviews and author interviews. There is a tour-wide giveaway and the prize is a Kindle. This giveaway is open internationally. I'm not normally a dystopian fan, however this sounds intriguing. Probably something my daughter would enjoy as well! Love the cover book looks very interesting. Love Y/A books, but I have never read a dystopian book before. Will have to add this to my tbr list. Love dystopian book and this must be amazing! It sounds really good. Great cover. Thanks for having the giveaway. Love the cover. Interesting review.Sounds really good. Thank you so much, Laurie, for hosting Jax Stone and her unique story. You have so many wonderful comments. I'm glad to have introduced both you and your followers to RATGIRL: Song of the Viper.